Real Christianity. Where is it? What is it? What does it look like? Surprisingly, a great many Christians are wondering that these days—especially those who once based their faith on the solid foundation of Jesus Christ but who have since become trapped in the rat race of performance-based faith . . . caged by the self-imposed demands of works and more works. Simple Faith isn’t about adding more religious demands to an already complicated existence. It’s about gaining freedom from tyrannical expectations and rediscovering the beauty of what Christ really taught. It’s about getting out of the cage and winging your way back to freedom, peace, and rest in Jesus Christ. It’s about discovering the heart of Jesus’s teachings and His life. Simple Faith recounts the real message of the Sermon on the Mount—what it means to live an authentic, uncomplicated life. In short, it is a call to simple faith. 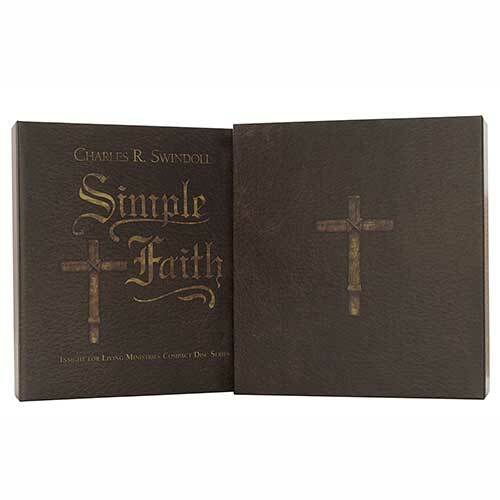 CD or MP3 series of 14 messages plus bonus audio message (Bonus material includes a conversation between Chuck Swindoll and Ney Bailey, facilitated by Mary Graham, where they explore the benefits of living a life of faith.) The MP3 version includes a 176-page downloadable Bible Companion. If You're Serious About Simple Faith, Stop This! Copyright © 1988, ℗ 2014 by Charles R. Swindoll, Inc. All rights are reserved worldwide.